I have moments when I am not sure about things. I am always battling with my hair, I am NEVER happy with it. When it's dark I want it light, when it's light I want it dark, when it's straight I want it curly... Get the idea? I recently dyed it a light ash brown all over and here's what it looks like. I have some old highlights trying to creep through. Today, I have decided I hate my hair dead straight, and the colour needs to be either lighter or darker... Ideas are welcome! And sometimes I have moments when I am sure. I love pink lips and I can trust it to look good all the time. I love "Ambre Rose" color sensational lipstick by Maybelline, it's a pale pink with a slight gold pearl, I wear it quite often on it's own but love topping it off with a pink lipgloss. 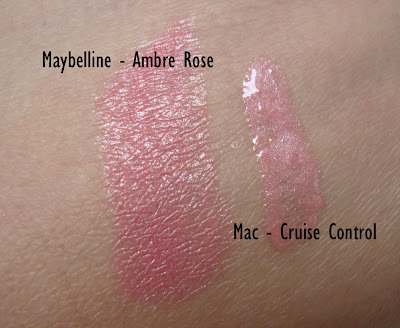 Maybelline Ambre Rose lipstick + Mac Cruise Control lipglass. You can see the slight gold reflects creeping through the pink.. I shall do a post soon about my favourite pink lipsticks, promise! What's your favourite pink lipstick? Muhsine I love your hair colour. How did u manage to get it that light? Im thinking about getting it lighter in turkey as I dont know any good hairdressers around here. One of my fave pink lipsticks is by MAC ltd ed called strayin from the hello kitty collection -lurves it! I tend to dye my hair with L'Oreal Ash Blonde.. Then I end up thinking it needs to be lighter, then when it is lighter I want it darker! I get bored of the upkeep (ie having to apply fake tan all the time to avoid looking washed out!).. Then I go darker and like it for a little while, then end up wishing Id not messed with it, or had gone just a bit darker rather than full on dark brown! I love ambre rose -been searching forever for it here -and its always out !!! And I ADore ANgel by MAC. You are exactly like me... i never am 100% happy with my hair and i wish it wasnt straight. Id kill for some waves! :( Mine never last when i plait my hair. Plumful by Mac - it really makes my blue eyes POP! Their lipsticks are fabulous. You hair always looks beautiful! My fav pink lippie is Dior in 664. Gorgeous! Love reading your comments, you girls are the best! 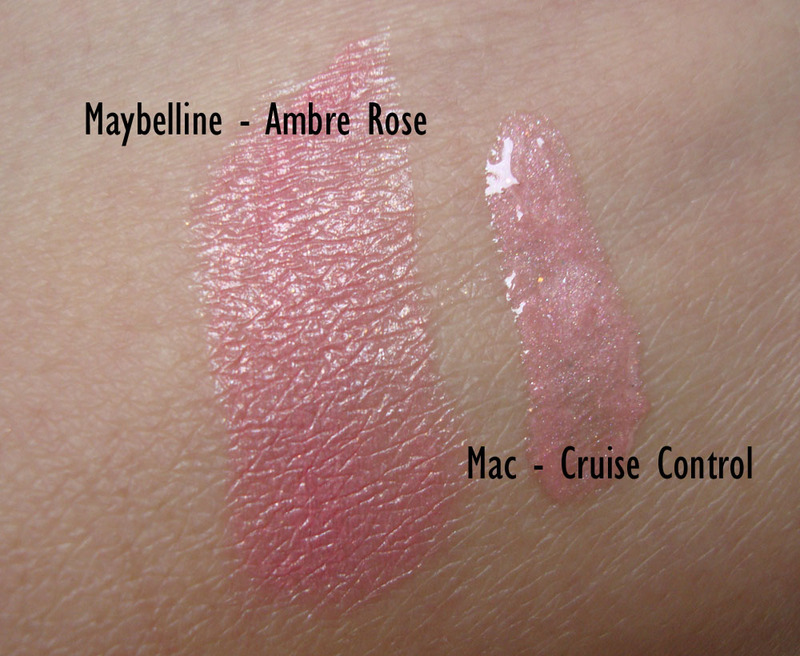 o is Ambre rose part of the Maybelline color sensational collection?? I need this lol I'm a sucker for pink lipsticks. Hey doll! I adore you with medium to dark hair, I think it compliments your skintone very well. I think you good with lighter hair too but Ive always personally been a fan of darker hair, especially with olive skin! Just looks gorgeous! As far as styling goes, you look wonderful 3with both straight and curly. I think its nice to be able to switch up with those two options, I wouldn't want to just stick with just one. Pinks def. fit you well too! I hope you can find something that works for you and that you just adore! I'm always unsure about a lot of things... lol. Loving the lip combo! Ok, first of all, you're nuts! haha. Your hair is completely stunning--all the time, no matter what! It looks amazing in that picture! The color, the straightness, everything about it. And you look great in any color! OMG Im the same right now..im thinking highlights and then I see someone with dark hair and I want it back! I really liked the colour you had in an old post with extensions..I think it might be the colour u have now lol! My favorite pink lipstick is MAC Angel. It always looks good regardless of what my eye makeup looks like! I think you should dye your hair a deep chocolate brown! I really think it would look amazing with your skintone! Ah, aren't we all a little hair-indecisive...? I normally hate my hair flat. I like for it to have some volume. So i blow dry and then straighten out on lighter heat and bigger chunks when the blow drying doesn't do the job. I think your hair color is great. I'm trying to go that light. But I'm doing it slowly. Don't want extreme hair damage.